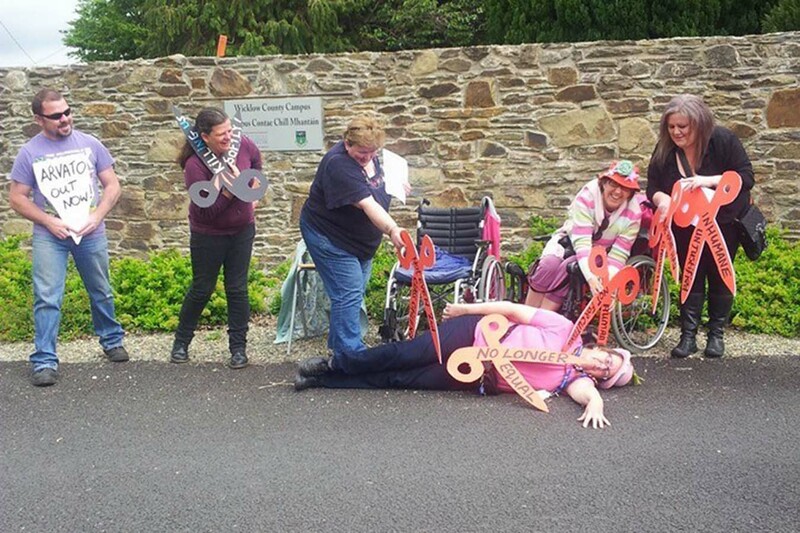 A small group of protesters ‘greeted’ Enda Kenny as he arrived at the Enterprise Centre Rathnew on Thursday. One disabled woman (Margaret Kennedy) ‘collapsed’ under the weight of all the cuts to disability services , other protestors l-r include Andrew Doyle is holding a poster saying “ARVATO OUT NOW!” This is the German company tasked with slashing medical cards, yes, German – Merkel is of course a good friend of Kenny’s. Anna Doyle (People before profit’ candidate for Wicklow) cuts her head off with scissors of ‘austerity’, it reads “Killing us softly”. Pat Cavanagh Independent Cllr standing for election stabs ‘collapsed’ disabled person indicating more wounds caused by severity of austerity cuts, whilst Ann Kennedy disabled twin of ‘collapsed’ woman on ground, gleefully tries to chop her head off! this replicates the shocking ‘gleeful’ smirking, jolly waves and smile Enda Kenny gave the protesters as he went through gates. a totally inappropriate response to those who are angry and suffering. THE COUNTRIES LEADER did NOT stop for a few words, finally Jacqui Johnson of People before Profit tries to collect the scissors and is concerned about what is happening. The protest also included (not in picture) parents of autistic and disabled children. Pat Cavanagh gave Enda Kenny letters from constituents as she was able to enter the event Enda came for. twins Margaret & Ann Kennedy are calling on all disabled people, ill people, elderly people to protest, protest, protest at the savage cuts . A very successful though small representation of people’s anger.